Tesla is currently building one salable Model S electric sedan a day at its California plant for quality-control reasons. Company officials anticipate the plant will ramp up to a production rate of 80 cars a day by year's end. FREMONT, Calif. -- Tesla Motors Inc. delivered the first Model S sedan today and hinted it plans to unveil supercharging technology that will allow owners to recharge the long-range electric vehicle in just one hour. Tesla chief technology officer J.B. Straubel said the company has developed a 90-kilowatt, 440-volt supercharging technology that can recharge a 300-mile-range car in one hour. "If you recharge a Nissan Leaf in 30 minutes, it's much different than if you can do a 300-mile Model S in 30 minutes," said Straubel, adding he likes to use "range per hour" as his recharging measurement of choice. He said the possibility of charging 150 miles of battery range in 30 minutes is "not science fiction," and that Tesla will be unveiling the technology "in less than one year." 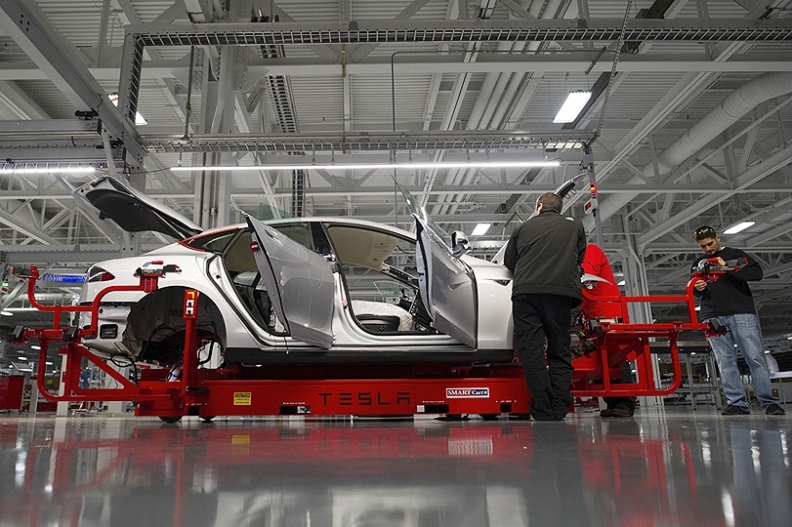 Tesla is currently building one salable Model S electric sedan a day at its factory here for quality-control reasons. Company officials anticipate the plant will ramp up to a production rate of 80 cars a day by year's end. Tesla's anticipated run rate by year's end would represent an annual pace of 8,000 units from a single shift, said Gilbert Passin, Tesla's head of manufacturing. So far, Tesla has built "at least 20" salable cars, which includes customer orders and dealerships demonstrator models, Passin said. Each vehicle currently undergoes a 100-mile test by Tesla engineers after it leaves the assembly line, Passin said. George Blankenship, Tesla's vice president of retail experience, said Tesla had 9,800 reservations worldwide for the Model S sedan at the end of the first quarter. That's up from about 8,000 at the end of December 2011. "Our first quarter was stronger than our fourth quarter [of 2011], which was stronger than our third quarter," Blankenship said. "We continue to have strong reservations." A buyer that plunks down $5,000 for a reservation will have to wait until May 2013 for the Model S to be delivered. Tesla is looking to shave the waiting time down to three months, but Blankenship could not give a timeframe for when that might happen. Tesla has 12 U.S. factory stores, including seven with the automaker's new design schematic in expanded real estate space located in upscale shopping malls. Tesla expects to add 10 new stores this year. Some will replace older stores; others will be in new markets like Scottsdale, Ariz., and the Northeast corridor between New York and Boston. The stores were supposed to draw 1,000 visitors a month, but Blankenship said the current customer flow is four times that.